Wake Forest introduced me toA� Physics 60-62; then I graduated from North Carolina State in Mechanical Engineering 62-64. General Electric, Salem Virginia and Edwards AFB California from 64 to present as a retired consultant in Salem. Everything I earn now is for my three granddaughters in college who inspire and lead me in ways I never imagined. 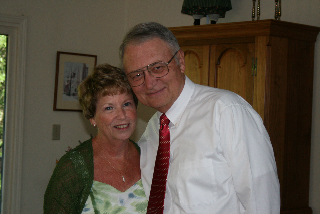 Celebrated my fiftieth wedding anniversary with Jane McCarraher Cannon this past July. We have five children (one died in infancy, one is adopted from Korea) and eight grand children. I live in the woods, make furniture, build houses, play with a backhoe and cruise the Virginia countryside in a sports car with Jane. I am a regenerated Christian and serve as an elder in a Baptist Church pastored by a top of the line, sold out to Jesus, Annapolis graduate with the tenacity of a warrior. All this said let me clear up the story. Up until I was about 35 years old I was a bad son, a sorry student, a poor friend and a marginally committed husband. Marriage transformed me to a large extent, but I was still pretty much worthless even though we kept reasonable appearances. I was a Sunday school teacher and Elder in a respected Presbyterian church, but this did not dissuade me from abusing my family and generally living a lie. Now pardon me if this offends, but at this point I recall Glenn Becka��s infomercial on his a�?religiousa�? conversion available on youtube, and it concerns me that there may be misunderstanding by association. Although my change in life is of a completely different origin, it was still on the order of a trashed life replaced with one of being authentically incorporated into the family of God, albeit a different god from Mr. Beck. I can only say that the Jesus of the Bible is my life. As I am sure everyone is becoming increasingly aware, our remaining time is very short. The day will soon arrive when we will die, and objective truth will no longer be unknown, ignored or denied. More and more I live for that day. So please dona��t avoid talking to me at the reunion; I am very interested in hearing everyonea��s life story and I wona��t bring up politics or religion unless you do.